TG1364AP – Excellent off-plan apartments for sale Ciovo are placed in two buildings, each building consisting of three levels and with one apartment on each level. One building contains 3 two-bedroom apartments and the other contains 3 three-bedroom apartments. Each of the two-bedroom apartments for sale Ciovo has the same living surface of 67m2 consisting of one en-suite bedroom, one more bedroom, one separate bathroom and an open-plan living area. The ground floor apartment has a 14m2 terrace and its price is €225.000. The first floor apartment has a 13m2 terrace and its price is €240.000. The top floor apartment features a 13m2 terrace and a massive roof terrace of 75m2; its price is €290.000. Each of the three-bedroom apartments has the same living surface of 88m2 featuring an open-plan living area, two bedrooms, two bathrooms and a third bedroom with its own bathroom. The ground floor apartment features an 18m2 terrace and its price is €285.000. The first floor apartment includes a 20m2 terrace and its price is €299.000. The top floor apartment in this building is already sold. The selling price of each of these apartments includes the use of a lovely communal pool and an outside parking spot. The buildings are located in a great area in the very center of Okrug, close to the sea, the main beach and lots of amenities. 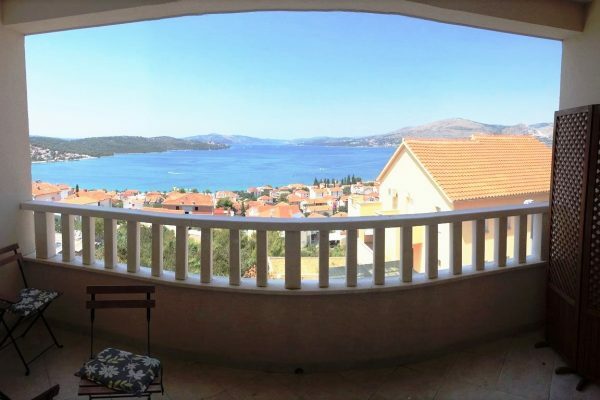 From here you have approximately 4 kilometers to Trogir center and 12 kilometers to the airport. The building process started in October 2018.